Are you planning to sell, publish, or place in other projects an Edna Purviance image? All these images have been identified as being Edna Purviance, but they are not. They have been published in books, videos, auctions, fan pages and other projects. 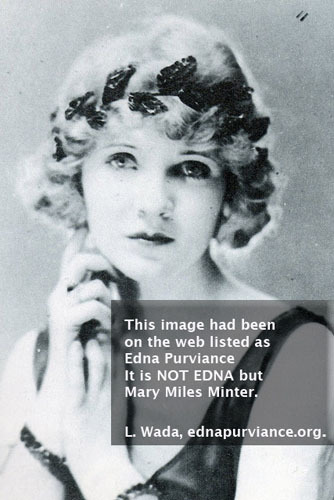 This is a page to help correct the errors in identifying Edna Purviance over the years. 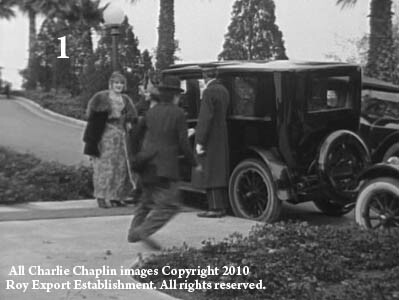 This image was caption as Edna Purviance in a well-known book about Charlie Chaplin locations. This is an often seen Red Letter Photocard, created by a British company during Chaplin's huge rise in 1915. The photo is from the film 'By the Sea' (1915). 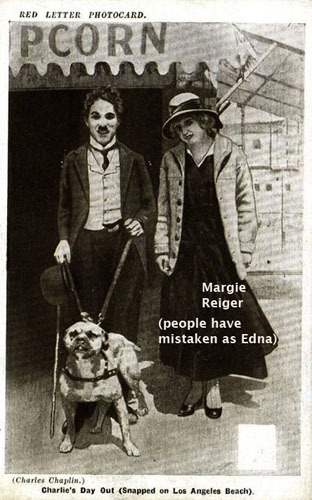 The actress is not Edna, but appears to be *Margie Reiger. Over the years, though, it's been listed as Edna in postcard auctions. It's clearly not Edna. This image I found in a well-know search engine of Edna Purviance images. The problem with an automated system, it doesn't know when people make mistakes in correctly identifying someone. In this case, it was a fan site that grouped this picture as being Edna. One person makes the original error, and it grows like a weed on the web.